Vietnam Memorial Has Spelling Errors Set In Stone The Martin Luther King Jr. memorial isn't the only monument in Washington, D.C., that's grappled with how to make a correction. At the nearby Vietnam Veterans Memorial, more than 100 names have been misspelled. So far, 62 have been re-engraved. 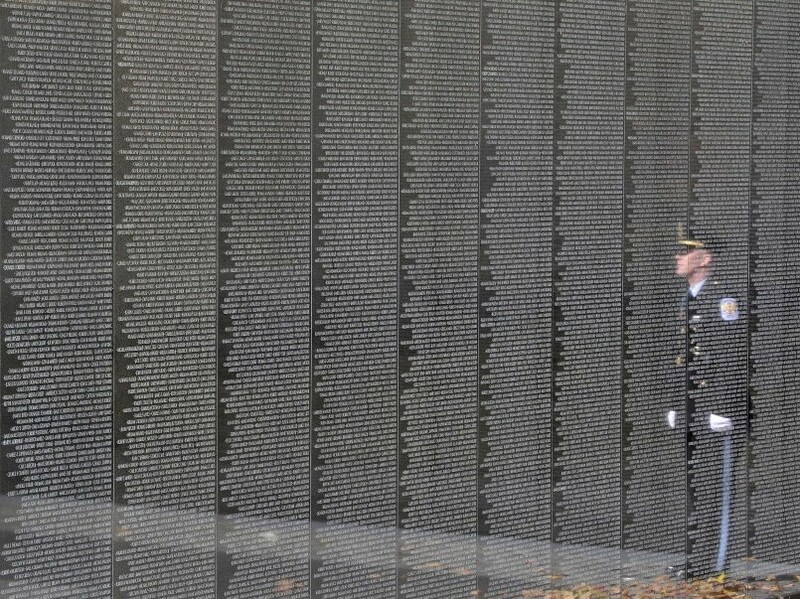 An officer is reflected on the Vietnam Veterans Memorial during a ceremony for Veterans Day in 2011. As National Park Service officials consider how to change a truncated quote on the Martin Luther King Jr. memorial, another group continues to slowly chip away at another set of mistakes on a monument that were also — literally — set in stone. The Vietnam Veterans Memorial in Washington, D.C., has more than 58,000 names of service members engraved in 144 panels of stone. But after the monument was erected in 1982, some of the names were found to be misspelled. Jan Scruggs, president of the Vietnam Veterans Memorial Foundation, says the monument is still "probably the most accurate memorial in the entire world." "But 1/10th of 1 percent of the names — a little bit over 100 — were misspelled," Scruggs says. "Sixty-two of them have been re-engraved." Scruggs says it costs about $4,000 to fix each name. Sometimes the change is easy — like changing an "L" into an "E." But other times, it means moving the name to another spot on the wall. "The second name on the Vietnam Veterans Memorial — as statistically improbable as it may sound — is actually one of those spelled incorrectly," Scruggs says. His name is Chester Ovnand — not Charles, as carved on the memorial. Ovnand was killed by the Viet Cong in 1959 while watching a movie. Scruggs said the foundation ended up moving Ovnand's name to a different panel. "Historically, that removes everything from the way this memorial was designed," he says. "The names of the people who died together are on the wall together and they are alphabetized by day. So when we found a place to put his name, we had to put him in with the 1966 casualties." But Scruggs says not every family chooses to have the mistakes corrected. Evangelista Pagan Rodriguez's first name is misspelled as "Evangelis" on the memorial. Scruggs says the family wanted to keep the Army private where he was on the wall — with the others who died in Vietnam on Nov. 26, 1966.